The self proclaimed movie critic, Kamaal R Khan is one certified crazy person on social media. Even Bollywood maintain their distance and try not to react to his filthy mouthful comments and remarks. KRK is unwanted man on social media( probably on planet too) who poke his nose in everyone’s business and pass negative comments. While everyone were going gaga over the magnificent work of art, acting and sets of Baahubali 2-The Conclusion, Kamaal R Khan spit the venom. 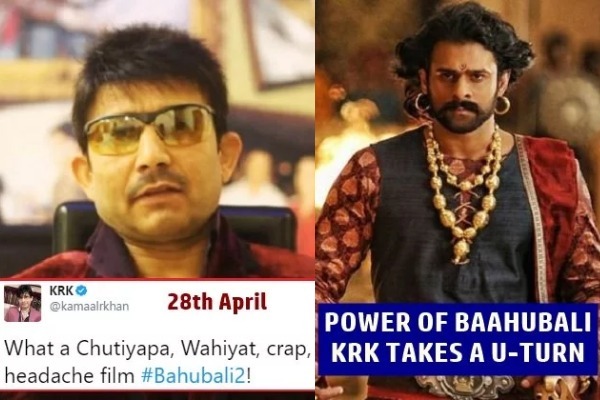 While everyone appreciated the work of SS Rajamouli and the star cast, KRK slammed director SS Rajamouli, referred Prabhas and Rana Daggubati as ‘CARTOONS’. Also Read: S S Rajamouli’s Baahubali 2: The Conclusion Creates History At The Box Office With Rs 1000 Crore Business! Hindi #Baahubali2 collected approx 20Cr on 3rd Sunday n definitely it's not a normal business. It's blessing of the GOD for @ssrajamouli??? Well, its not everyday we see Kamaal R Khan apologizing and then changing his tone at such sober level. Nevertheless, he was trolled even for his U-Turn and twitterati took left,right and center instantly.